Responsible, Reliable Roofing from RBC. Our success in North Texas is built on delivering quality service since 1990. 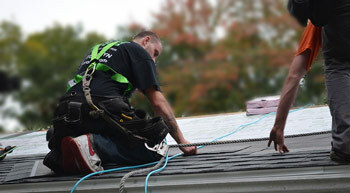 Our roofing experts will provide you with the right solutions for home every time. If your home is in need of roofing or gutter services, RBC Roofing are the local experts you can trust! With years of experience providing quality roof repair, roof replacement, gutter installation, and siding installation services, we have everything you need to keep your home protected from weather damage and looking its best. Our experts will help you get the right solution for your home, from minor repairs to full roof replacement. Call us today or click below to get started with a free estimate! We offer all our services in Ft. Worth, Arlington, Frisco and the nearby areas. Keeping your roof well maintained is best for your home's weather resistance and longevity. We can help with everything from roof leak repairs to storm damage repair to full roof replacement. We service a wide variety of roofing materials, including asphalt shingles, metal roofing, and flat roofing, allowing you to get the right solution for your home. RBC Roofing is also the local authorized Gutter Helmet® dealer in North Central Texas, and we can provide you with quality gutter and gutter guard installation. Gutter Helmet® products are proven to keep your gutters working correctly and help prevent flooding. We can help you determine if Gutter Helmet® is right for your home. In addition to our roofing and gutter services, we also provide siding installation, skylight installation, and patio installation. No matter what you need for your home's exterior, RBC Roofing is here to help! Call us today at 1-817-360-2505 or contact our expert contractors online to get a free estimate on the cost of any our services. We offer all our exterior home improvement work in Ft. Worth, Arlington, Frisco, Mansfield, South Lake, Killeen, Carrollton, Denton, Waco, Lewisville and throughout the surrounding areas.